I was born in Puerto Rico, grew up in Jackson, MI. Escaped for many years after college, but now back, at least for a while. Number of years running: 15 shod, now 2 BF! Time in club: 1 year? Or is it 2 now? Basically when it first started up. My most unusual or memorable running experience is probably the Woodstock 50K I ran last year. I had no idea if my bare feet could last that long, or even if my body could last that long. But they did. My favorite distance to run is hard to determine. I tend to run for time. I usually only get into my 'zone' after a good hour. Two hours seems to be the longest I can sustain the zone and still feel strong. My four-hour route leaves me feeling exhausted for the rest of the day, though that's not a bad thing! My favorite race is hard to choose. If I had to just pick from when I ran shod, I'd say my first marathon ever, in Chicago, just because it was so huge, with so many people, and so many bands, and runners in costumes, and the huge crowds of spectators. But, since I've started running barefoot, each race feels amazing. My first trail marathon, then the Detroit Marathon, first time after plantar fasciitis woes. And, the Detroit Marathon after that, where I beat my best time ever, from 12 years earlier in Chicago, shod. And, the two 50Ks I did last year were just amazing. Running barefoot, every single time I run becomes an adventure. My personal records for races are: 1:39 for a half-marathon, 3:59 for a paved marathon, 5:00 (I think) for a trail marathon, and 6:00 for a trail 50K. All barefoot. I run barefoot mostly, weather permitting, and sometimes minimalist, either when the Michigan winter is too much, or if my feets are a little raw. I have a pair of VFF KSOs, but prefer my Luna huaraches because they're even more minimalist. This winter I also wore Minnetonka moccasins, with socks on really cold snowy days. Their leather bottoms would wear out pretty soon, but they actually feel pretty good. I started to run barefoot because I got plantar fasciitus and after a year and a half, and three doctors, and all kinds of stretching, and icing, and orthotics, nothing was working. A friend suggested barefoot running, and at first I was like, no way. But I googled around and came across Barefoot Ken Bob's site, which convinced me to try it. And I was running immediately. But I run in general because I'm a physical person. I like reading, writing, contemplating life, but I also like to work, to get physical, perhaps as way to counterbalance my busy brain. I also like challenging myself, to see what my body can do. I also enjoy running as a meditative activity. I zone out, thoughts come, and then they go. Nothing I can do about them, which is a nice reminder that life is like that: it comes, and goes, and there's not a lot we can do about it. I also write, poetry, fiction, creative non-fiction, and I'm a musician: electric bass, and also acoustic guitar and vocals. When I can afford it, I travel, both to other countries, and also backpacking/camping here in the States. 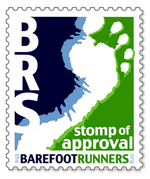 I joined the Barefoot Runners Society as a way to connect with other BFers, and to maybe feel not so alone. I get a lot of weird looks, and even comments, from shod runners, which makes me feel like a freak. I guess being a freak is a good thing, but having a sense of some kind of community, even online, does help.